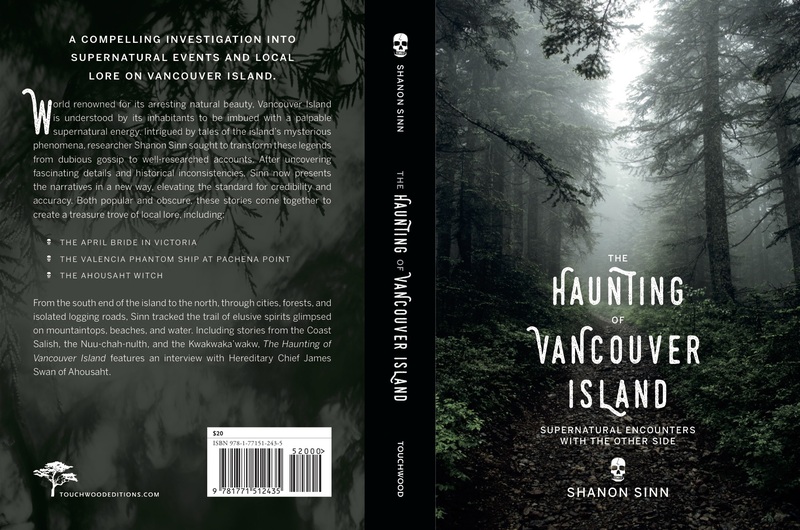 The Haunting of Vancouver Island has officially been sent to print — and honestly, I couldn’t be happier with the finished product. The book will be released on October 10. TouchWood Editions has turned my manuscript into something truly beautiful. The font is darkly spellbinding, the images have been carefully inserted, and the cover boldly captures the otherworldy spirit of the book. My mouth literally fell open the first time I saw it. There are so many people who have helped make The Haunting of Vancouver Island become what it has. So many, in fact, that I feel humbled to have my name on it. The “Acknowledgements” section is several pages long and includes images of Chief James Swan of Ahousaht and fellow investigator Sean Enns. There were literally dozens of people involved at one stage of the creation of the book or another. I really hope that everyone who reads the book will take a moment to go through the “Acknowledgements” section. I am incredibly grateful for everyone who has helped me. The cover, as you can see, has been posted above for your viewing pleasure. As you may have also noticed, there’s a new The Haunting of Vancouver Island banner for the blog as well. This is the same banner you will now find on my Twitter and Facebook feeds. TouchWood Editions Designer Pete Kohut created all of the visuals and branding. Truly impressive if you ask me. I will be posting a lot more regularly here again, which is good news for the blog. Just in time for Halloween! There will be announcements, content that will not be in the book, and The Haunting of Vancouver Island excerpts in the months ahead. Before I leave you with images of the table of “Contents” (a sneak peek if you will), let me also announce that the book is now officially available for preorder through Indigo and Amazon, as well as other bookstores. If you are interested, prices are usually somewhat less when a book is purchased early. This week is cosmically about beginnings. Tomorrow, the sun will die and be reborn. This is a rare event. As happens once every month, the moon will also collapse into nothingness and emerge as a growing beacon once more. In these times of literal darkness there are always ghosts. The new moon is when many indigenous cultures traditionally shared stories of spirits and hauntings. Even more horrifying tales were reserved for the time of the eclipse. Ghost stories remind us of our own mortality, insignificance, and communal need for moral strength. So, if you think of it, pass one along this week. In my experience, whenever I share a ghost story someone gives me one back in return. That, in itself, is always a good thing. This entry was posted in Ghosts, Vancouver Island, Xtra: News and Reviews and tagged Book Release, British Columbia, Chief James Swan, Ghost, Ghosts on Vancouver Island, Haunted, Haunted Vancouver Island, Haunting, Pete Kohut, Sean Enns, Shannon Sinn, Shanon Sinn, The Haunting of Vancouver Island, TouchWood Editions. Bookmark the permalink. where can I get this book – as my family is from Vancovuer Island and would love to read this book. As I have been brought up with stories — myth, legends, ghost stories and just plan stories from the past. Hi Dawn 🙂 the book will be available in bookstores across Vancouver Island including the ferry, museums, and gift shops. I’m not sure which stores on the mainland will carry it. It is also available for preorder from most book stores. The links for Indigo and Amazon are in the blog post here as well. If you do read it I hope you enjoy!